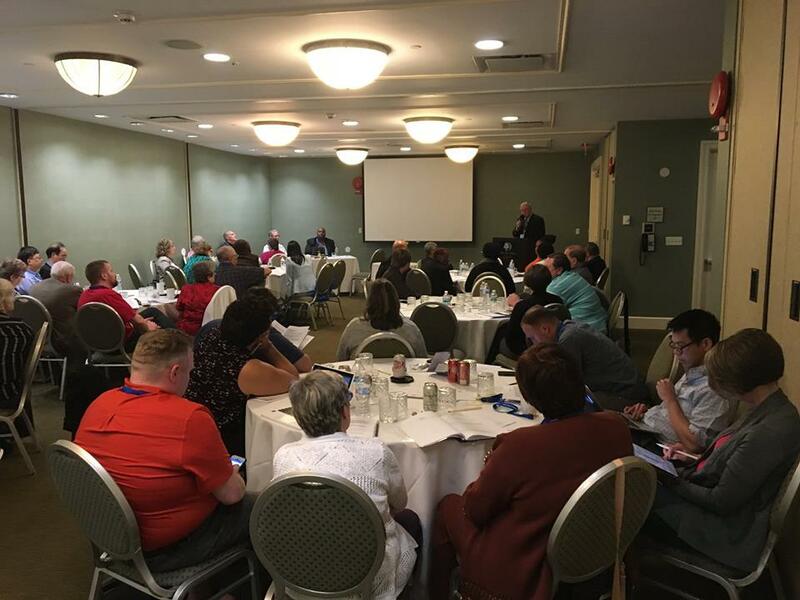 The Regional Synod of New York held its 2018 Annual Meeting on May 5 at the Doubletree Hilton in Tarrytown, NY. On May 4, a day of workshops offered by various people, many valuable and interesting presentations were made. We thank Rev. Joseph Holland for his discussion on faith based real estate development for churches, Rev. Bob Chase for his discussion of his book Beyond the Comma, Rev. Dr. Michael Bos for a conversation about Collegiate Church and its dual affiliation, Dr. Allan Janssen for a presentation on a fresh look at the Belgic Confession, and Mr. Matthew Mattingly who shared valuable information regarding insurance issues for churches. On Friday evening, a dinner was held and our keynote speaker was Rev. Bob Chase, Founding Executive Director of Intersections International. Rev. Chase shared some of his experiences in his work with Muslim communities as well as his work to bring God’s shalom to Muslim/Christian relationships. At the Annual Meeting itself, Synod President, Rev. James Steward, offered two recommendations that were passed by the delegates. The first is to launch a year-long fundraising campaign to benefit churches who need significant repairs to their historic buildings with a focus on urban churches. The second instructed the Executive Minister to gather information regarding the structure of our synod, including but not limited to: current classis boundaries, potential new classes, classis viability and needs for the future. This work will include conversations with the 7 classes about their needs and how the regional synod may reorganize in order to best serve our classes and churches. The Human Support Committee is planning to create a manual of best practices for student care to be made available to all classes. Mission, Outreach and Social Concerns Committee brought to the synod’s attention that 37% of New York college students are in danger of going hungry and 6% are homeless. The Committee asked for an additional $2500 in their 2018 and 2019 budgets to begin to address this concern. They plan to begin with SUNY New Paltz to gather information and develop a plan. Rev. Ken Tenckink, Executive Director of the Warwick Conference Center announced his pending retirement at the end of this year. The synod offers its thanks and prayers for Ken and his wife, Arlene, for their decades of faithful service. Treasurer Susan Meaney reported that we did not need to draw from reserves last year as we had anticipated but foresees that we will have to in 2019. The Exec Committee will not raise assessments next year but may have to revisit both assessments and expenses for 2020 in order not to continually draw on reserves for operating budgets. The synod thanks Mrs. Meaney for her commitment and hard work on its behalf. Rev. Conrad Strauch, Stated Clerk, read the proposed amendments to the bylaws recommended by the By-laws Review Committee. No objections were expressed. The second reading of the amendments will take place at the fall gathering on November 3, 2018. Officers were elected for 2019: President, Rev. James Steward; Vice President, Mr. Steve Dambra; Second Vice President, Rev. Dr. Albert Potgieter; Treasurer, Mrs. Susan Meaney; Stated Clerk, Rev. Conrad Strauch. Our Synod Fall Gathering this year will take place on November 3, 2018 at the Greenville Community Reformed Church in Scarsdale, NY. This meeting will focus primarily on a synod-wide conversation regarding decisions made at General Synod 2018 and how we will respond to changes that come out of General Synod. All are welcome at the fall gathering. We hope to have a large turnout in order to have a full and rich conversation about our future as a regional synod. As always, if you have questions or need information, please contact the synod office at 914-332-1311 or newyorksynod@gmail.com.